The Blake Memorial Library is a community resource developed by community members to promote learning and sharing. We aim to encourage the people of the Waits River Valley to read, to explore, to think critically and creatively, and to come together to share ideas and inspire each other; we strive to provide them with the tools to do so. What About the Blake in Blake Memorial Library? 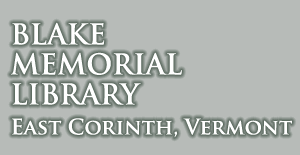 The Blake Memorial Library started “with a wheelbarrow full of books.” In the early 1890’s three young men in East Corinth decided the town needed a library. After locating and preparing a room to use, they took a wheelbarrow through town asking for contributions of books. These three men, and others who joined them, were informally organized as the East Corinth Library Association. Throughout the decade, they raised money for books and expenses by holding dances, fairs, etc., moving the library from one location to another as circumstances necessitated. In November 1900, the association acquired the present library site. The secretary of the association, in an attempt to find financial support for a permanent library building, contacted several former residents including Almira Blake Gendrot Fenno of Boston. Nathan Blake, III, Almira’s father, had come to East Corinth in 1817, where he lived until his death in 1849. His three surviving children moved to Boston in 1852, but had kept in close contact with the town and had contributed books and magazines to the library. After much correspondence, the Blakes decided to give the town the building as a memorial to their parents, Nathan and Susan Blake. In 1902, the new building was completed and dedicated. 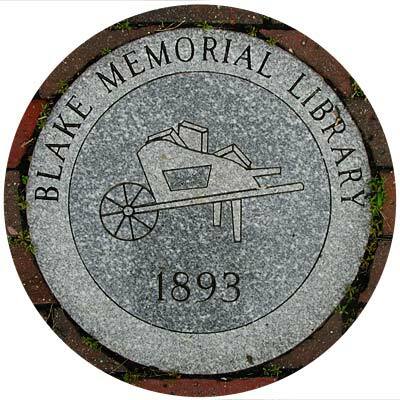 The Blake Memorial Library Association was formally organized. The Blakes’ original endowment soon became insufficient to meet high costs and for several years the Blakes paid for books and insurance. When Charles Blake died in the1920’s, he left several thousand dollars in trust to the association as did his sister, Almira, a few years later. In 1945, the Blake Memorial Library burned. The entire contents of the library were lost including the irreplaceable artwork given by Almira, much of which was her own. The association was left with 200 to 300 books that had been in circulation. Work was soon begun on a new, much simpler building, as funds were short, despite the generosity of the Blakes. In 1949 the new library building was dedicated and opened to the public soon after Felix Gendrot, Almira’s husband, visited the town. Pleased to see a new building on the site, he made provisions to aid the library financially. Upon his death in 1956, the library received in trust a large portion of his estate. An addition to the library was built in 1961 and called the Felix Gendrot Room. 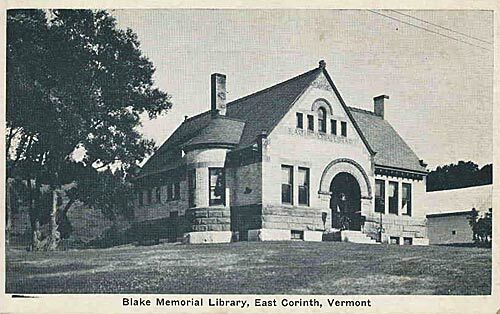 The original Blake Memorial Library burned in 1945. 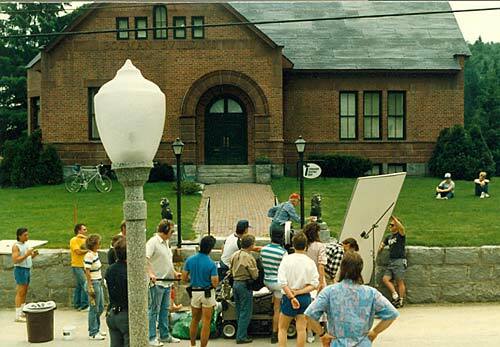 The library received a false front to look like the original building for the making of the film classic, Beetlejuice, filmed in 1988. It [the library] is yours for the good of a united community, with a united will, understanding, and cooperative spirit to make of it a model of efficiency, a beacon light in the country; and to this end all can contribute by sinking all personal or partisan preferences and putting library efficiency as their foreword. So there we leave it all, to future generations to guard, cherish, and develop to the best of their ability. Information quoted, in part, from the Times-Argus, Barre, VT, April 16, 1975.